One of the biggest challenges facing retailers regardless of whether they are online only or have physical locations, is price. Consumers will always try and buy for the lowest price, which means profit margins are cut ever thinner to try and be competitive. Walmart is no exception to this rule, but the retailer's latest discount idea trades a little customer convenience for potentially large savings. On April 19, Walmart is introducing Pickup Discount. 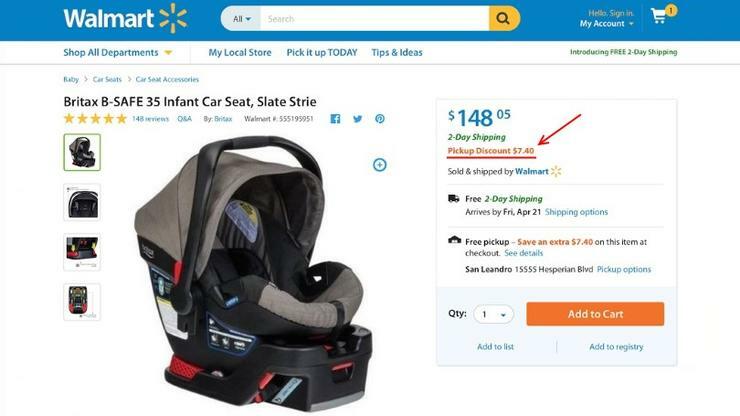 It allows customers to claim a discount on products offered only through Walmart's online store if they choose to pick it the items rather than having them delivered. The online purchase goes through as usual, but instead of a delivery to your door, the order ships to your local Walmart. The savings can be just a few dollars, for example, the Coleman 150 qt Heritage XP Marine Cooler is $111.49, but gets a $4.46 Pickup Discount. However, some items offer much bigger discounts, for example, the VIZIO SmartCast M-Series 70-inch 4K Ultra HD TV costs $1,698, but gets a $50 Pickup Discount. That's on top of the $300 discount Walmart already applied to the list price. If you buy a number of these items together, you can see how the savings could stack up. For Walmart, the discounts can be offered because the most expensive part of shipping is the "last mile delivery costs," meaning the trip to each home. By instead putting products on one of the company's more than 6,700 trucks traveling to stores, it saves quite a bit of cash. For the customer, it's a trip to Walmart, which many will be happy to do if they just saved tens or even hundreds of dollars. According to TechCrunch, the idea for Pickup Discount came from Jet.com's Smart Cart technology. Walmart acquired Jet last year and quickly started taking advantage of how the company allowed consumers to save money with more purchasing options. Initially, around 10,000 products will be listed with a Pickup Discount available at more than 4,000 stores. By June, Walmart wants to get that to one million products. It also looks likely there will be multiple ways to get your item once in store, with the Pickup Tower vending machine likely playing a major role, as will curb side pickups.